Ultimate Purina Experience: Enter to Win! Here’s a chance to win the Ultimate Purina Experience! Enter to for a chance to win a special behind-the-scenes VIP trip for two to St. Louis, MO. 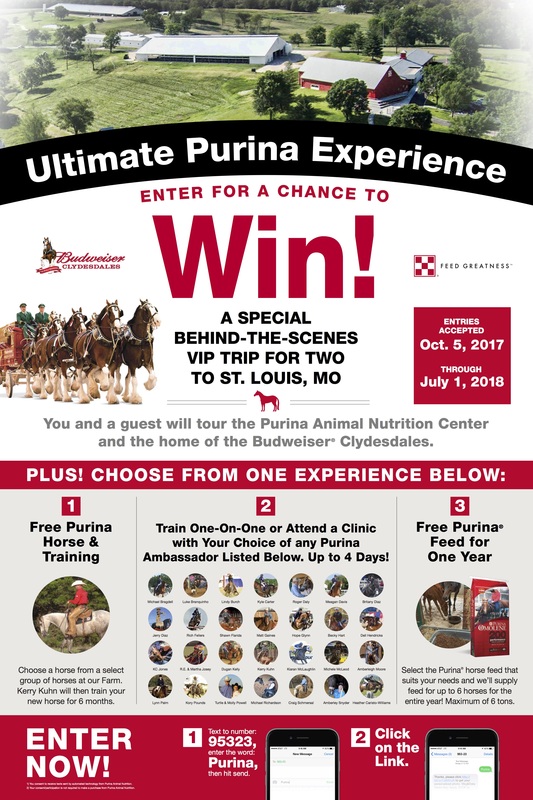 You and a guest will tour the Purina Animal Nutrition Center and the home of the Budweiser Clydesdales! Plus, in addition to the tip, you get to choose from one of the 3 options below! Free Purina Horse & Training! Yes, you read that correctly! You can choose a horse from a select group of horses at the Purina Farm. Kerry Kuhn, A Purina Ambassador will train your new horse for 6 months! Already have a horse? Well, this option lets you train one-on-one or attend a clinic (for up to 4 days) with your choice of any Purina Ambassador listed on the flyer. Or you can choose to receive free Purina Feed for one year. Select the Purina horse feed that suits your needs and Purina will supply feed for up to 6 horses for the entire year! Maximum of 6 tons. How do you enter? TEXT to number: 95323, and enter the work PURINA. Then hit send. Fill out the questions and you are entered! This entry was posted on Tuesday, November 21st, 2017 at 7:31 pm	and is filed under News & Updates. You can follow any responses to this entry through the RSS 2.0 feed. Both comments and pings are currently closed.